Yes, the new Q50 would not be our chariot from Los Angeles to San Francisco. Instead the 2017 QX50 would handle the load. The original plan was to cram into the Q50 and drive as quickly to LA as possible. Concerns of comfort and practicality were far from our mind. When the road is mostly flat and the terrain resembles a water color painted in varying shades of brown all you really want to do is mash the throttle and see what happens next. As it turns out the Infiniti QX50 was surprisingly capable of feeding our animalistic need for speed. Under the hood is a beefy 3.7-liter V6 engine that sends 325 horsepower and 267 lb-ft of torque to the rear wheels. All-wheel-drive can be had for $1,800 more, while the transmission is a seven-speed automatic with paddle shifters. The specs are outstanding when you consider that this is the only engine on offer. A base QX50 with an MSRP of $34,450 has the same amount of power on tap as one packing $8,290 worth of extras, like our car had. The QX50’s V6 was plenty capable of motivating the 3,855-lb crossover. Whether the task was pulling ahead of slowpokes in the fast lane or shooting out into a river of traffic on a crowded Los Angeles street, the powerplant provided exceptional acceleration. The 2016 QX50 (we couldn’t find stats for the 2017) does 0-60 mph in 5.6 seconds. This is the type of power you appreciate less for the thrills you get in straight lines and more for the practical benefits it offers, like darting across a busy two-way road to make a daring left turn. The QX50 does offer rev-matching downshifting when you elect to use the paddle shifters. Manual mode is useful in passing situations but this isn’t an overly sporty car. Cruising is the name of the game here. Needless to say we did a lot of that on the six hour drive from San Francisco to Los Angeles, averaging 21.4 mpg. Shockingly that’s not far off the official mpg ratings for the QX50, which come in at 17/24/20. The ride itself was comfortable if a bit noisy at times. The practicality of a crossover ensured that three people and their bags fit just fine, although there wasn't much room to spare. The QX50 used to be smaller before a refresh in 2016. In addition to cosmetic changes the wheelbase grew by 3.2 inches and the overall length shot up 4.5 inches. Rear passengers gained 4.3 inches of legroom. While whoever sat in the back had ample legroom the Infiniti’s lack of cargo space did prove to be a problem. Three people and their bags—including video equipment—proved to be too much for the QX50’s 18.6 cubic feet of storage space (with the rear seats folded up). Putting a bag or two in the back seat with three people in the car isn’t the end of the world but with four it would've been tight. A lack of cargo space isn’t the only problem the QX50 has. The cabin is nicely appointed with standard features like a heated power driver’s seat, leather seats, a 7-inch infotainment screen and a moonroof. However, the design is dated. Just look at the infotainment system! Why does it (still) have all those buttons? For the base model’s price of $34,450 these complaints can be dismissed. But most consumers will likely add at least one optional package to the QX50. Navigation is part of a $2,000 package. The passable Bose 11-speaker sound system is rolled into the $700 Premium Package. Should you push into the $40,000+ range the dated design of the dash becomes more glaring. The same is true to a point of the exterior design. 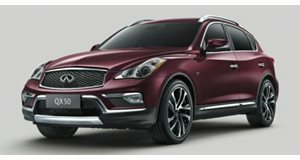 There hasn't been a major redesign in the almost 10 years since the QX50 first burst onto the scene as the EX35. Funnily enough we actually walked right past the crossover several times by accident. This happened in crowded parking lots but also on quiet suburban streets. The design isn’t bad. It just doesn’t really stand out anymore. Back in 2008 an SUV with the look of a coupe was novel. Nowadays it’s commonplace. 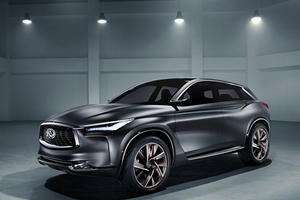 A new QX50 should debut sometime in the next year or two and look like the shockingly awesome QX Sport Inspiration concept which is headed to Detroit. Until the new model debuts it is tough to get excited about the crossover. That being said the refresh has paid dividends for Infiniti as sales are up over last year. After putting more than 800 miles on the 2017 Infiniti QX50 the consensus we came to is that it’s perfectly OK. Aside from the engine there’s no real standout feature here. It’s a good bargain buy that surprises with the amount of standard features it offers. If you find yourself driving one from San Francisco to Los Angeles and back you won’t be disappointed. Just make sure to sound the alarm when you go looking for it after a long day at work...or the morning after a long night out. Thank heavens the designer stuck close to the QX Sport Inspiration Concept. 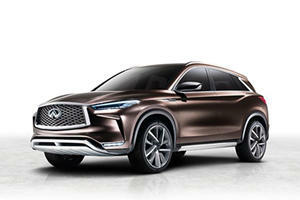 Please Infiniti, let this be the replacement for the QX50.